A new kitchen is always a luxury, even for someone who is surrounded by decor and new projects all the time. So when Interior Designer & TV design judge Shaynna Blaze designed her new kitchen, all eyes were on her. I knew you’d be keen to get some ‘inside kitchen design tips’ so I asked Shaynna some questions about her latest decor triumph. Shaynna, please share with us your top three ‘must-haves’ and kitchen design tips for creating a dream kitchen? A good layout – the flow of a kitchen, the way you cook and entertain are all important so you do need to be aware of all the appliances you need and the different functions you want your kitchen to perform. Personally, I never want to take more than two steps for each action when I’m cooking. Low maintenance surfaces – Again, look at the type of cooking and entertaining you enjoy. It’s all hard enough with dirty dishes & food spills without trying to keep the surfaces looking clean. So whatever type of cooking you like, choose surfaces that work with, not against, that. For example if you do a lot of frying on the cook-top, a mirrored splash-back is not for you. The biggest fridge possible – having a wide fridge to hold serving platters and large shopping trips for my family is the key to keeping us fed. How did you choose the colour scheme? I wanted to be sympathetic to the 1880 Victorian house in which we live, but I still wanted a modern solution. The white island bench worked with the traditional features while the steely grey on the back cabinets not only added a modern touch but helped work in with the appliances, so as not to make them stand out too much. 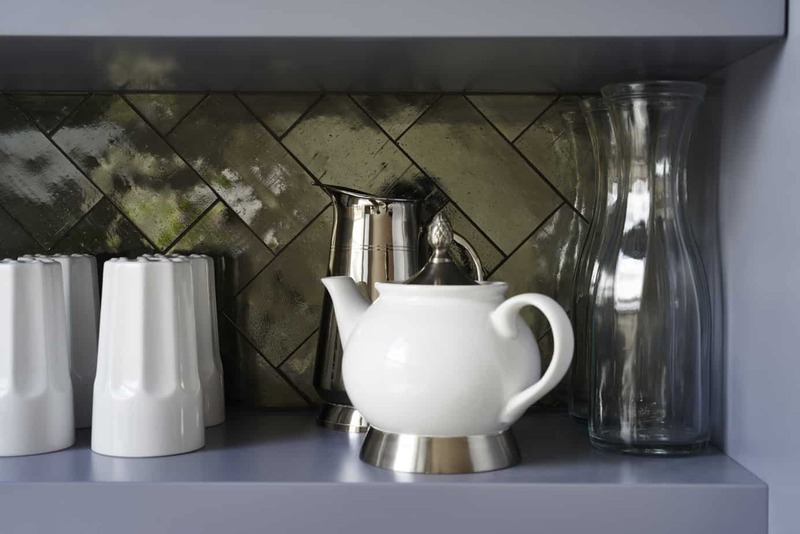 Do you have a favourite feature in your new kitchen? I absolutely love the huge oversized island bench. It’s 1500mm in depth so tons of space for food preparation and entertaining. I can fill the bench with food while still having room to eat and entertain. 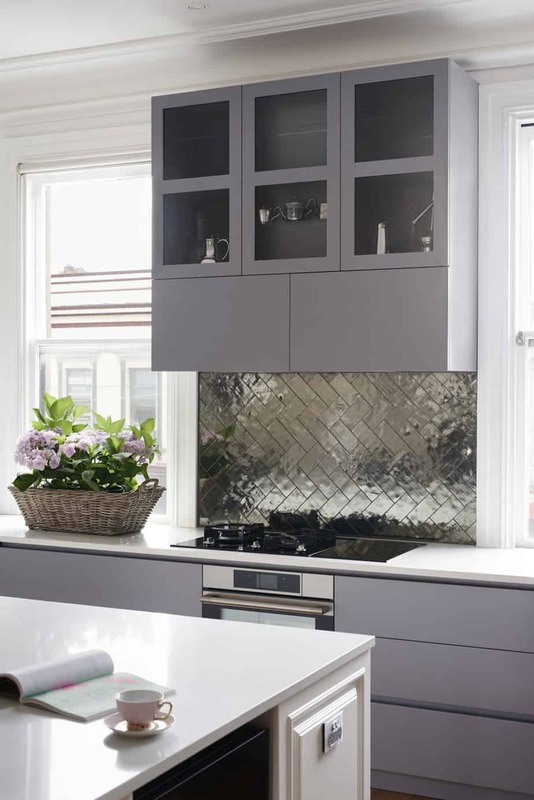 The surfaces are very interesting; how did you choose the benchtops, cupboards, flooring, and splashback? I went for white composite stone on the benchtops so it would work with the traditional white features in the existing interior. The splashback had to be serviceable and reflective to catch the light so the slub mirror tiles are perfect for hiding a multitude of sins. Putting them in a herringbone pattern gave a modern twist to a period style. There are actually two cupboard styles in the kitchen with feature colonial panels in the island bench. I kept the back cupboards as flat panels because feature panels everywhere would have been overwhelming. The floorboards are the original Baltic Pine so I love the contrast of the aged and dented boards against the shiny modern appliances. 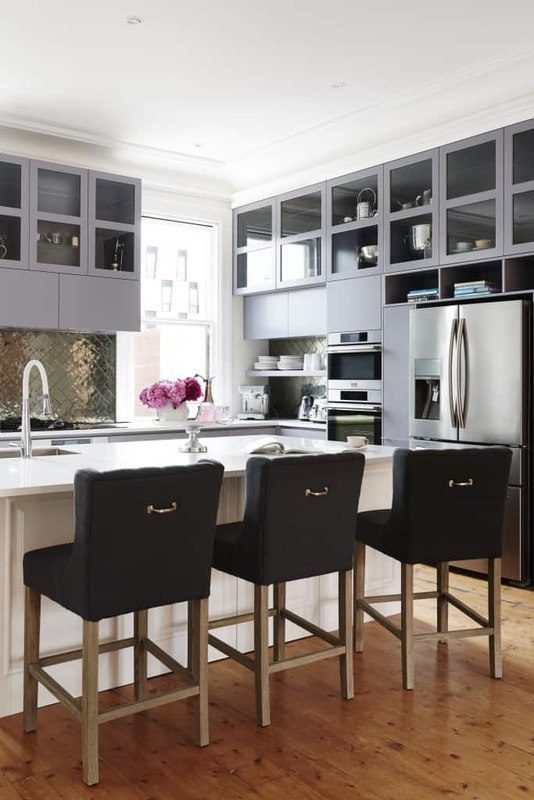 Is there any advice you’d like to give readers who are thinking about a new kitchen? 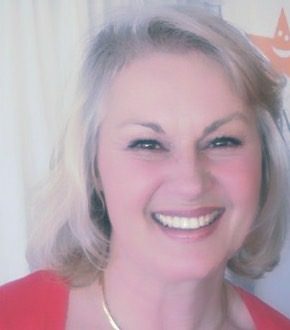 I always ask clients to work out if they are a cook, a chef or an entertainer. This is the perfect starting point to work out the type of layout, the size fridge and the type of appliances you will need. Always focus on this point before getting to colours and surfaces. Of course it needs to look good but mostly it needs to let you cook or entertain effortlessly. 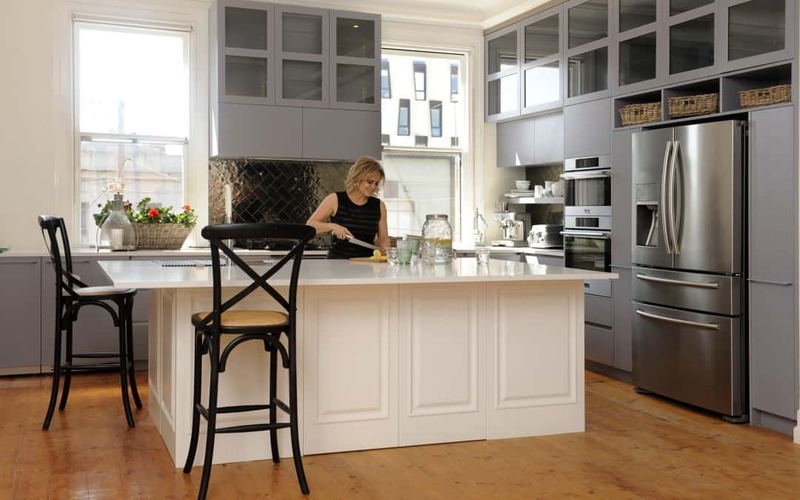 What do you think of Shaynna’s new kitchen? Were her kitchen design tips useful? What’s the biggest challenge in your kitchen? If you liked this article then check out the unique features of Things of Stone & Wood, how to extend your outdoor living with All Decked Out, curvacious decor with Easter Inspired Decor, and the 150 million year old Caesarstone surfaces; they’re amazing. And! I just noticed the handles on the bar stools. A very cool touch. Love Shayna! Love Don’t Call Me Penny! I love the slub mirror tiles of the splash back. So clever putting them in a herringbone pattern. Classic and modern all at once. And most of all, practical. Love it. Thanks for sharing Pen!